April 20, 2018 -- Like many of her friends, Alexandra Callner, now 58, experimented with recreational marijuana when she was younger. "It was making me kind of nauseous," she says of the nonsteroidal anti-inflammatories. Plus, she needed to stay active to manage her dog boarding service in Pasadena, CA. Then came another solution. "A neighbor said, 'Try this,' " Callner says. It was a joint. Callner got a medical marijuana card, and then she tried it. “I slept through the night." Adds Angela Bryan, PhD, professor of psychology and neuroscience at the University of Colorado, Boulder: "The evidence we have thus far suggests that cannabis is moderately effective for pain relief." But most studies haven’t compared marijuana with other ways to relieve pain, she says. Although medical marijuana in some form is legal in 30 states and Washington, D.C., it’s still illegal on the federal level. It’s classified as a Schedule I drug -- putting it in the same category as other drugs of “high potential for abuse” that have ''no currently accepted medical use," such as heroin and LSD. "In the state of Colorado [which allows medical and adult private use], I can go to any dispensary and buy whatever I want to treat whatever I want," says Bryan, who's also co-director of the CU Change Lab, which explores health and risk behavior. "You would think that means researchers can, too. The problem is, researchers are in a federal institution [at the University of Colorado]. If we do anything in violation of federal law, we could have all federal funding withdrawn." "If I want to do a study on alcohol, I bring someone in, give them wine, get blood [samples], and see what happens when they use alcohol." Patient groups, including those for veterans, are among those pushing for more research. Nick Etten, a former Navy SEAL, founded the Veterans Cannabis Project in 2017. "We are bringing stories to the Hill," he says, ''of veterans who have found relief from their health issues through cannabis." He reaches out to individual U.S. legislators, he says, to elevate marijuana as a health issue and to persuade them to declassify marijuana. In 2016, the National Football League Players Association created a pain management committee to study ways to help players deal with injuries and chronic pain, says Brandon Parker, a spokesman. "Marijuana is just one of several alternative pain relievers being studied by the committee," he says. In a small study of 47 patients with Parkinson's disease, Israeli researchers found a 27% improvement in pain with marijuana use. Medical marijuana helped to ease pain in 26 patients with fibromyalgia, a condition in which the body has ''tender'' points. Half the patients stopped taking any other medicines for fibromyalgia, but 30% did have mild side effects. Her experience helps her guide her customers, who range from young adults to those over age 80, to an effective remedy. "I would say 60% of our users use [marijuana] to manage some kind of pain, whether it be physical or mental," she says. Without it, her pain is severe -- usually a 4 to 7 on a 10-point scale, she says. It started after she was in a car accident in 2011. The van she was riding in hit black ice and flipped seven times. The accident left her with a broken sternum (breastbone), six broken ribs, six crushed vertebrae, and collapsed lungs, making breathing difficult. Morphine helped relieve the pain in the hospital. Later, she says, "I could get any pill I wanted'' for pain relief. She wore a neck brace for 2 months and a back brace for 6, but the pain persisted. She wanted off the potent painkillers and had used marijuana recreationally in years past. She experimented with different options until she found her current regimen. And to make access easier, she and her husband moved from New York City to Los Angeles, where recreational marijuana is legal, last year. Before the move, the pain had gotten so bad, she had trouble putting on a shirt. These days, she's working regularly and branching out as a freelance artist. "The lack of pain is a wonderful thing," she says. "It brings me to tears." The National Academies of Sciences, Engineering, and Medicine: The Health Effects of Cannabis and Cannabinoids: The Current State of Evidence and Recommendation's for Research," January, 2017. National Conference of State Legislatures: "State Medical Marijuana Laws." National Organization for the Reform of Marijuana Laws (NORML): "Legalization." 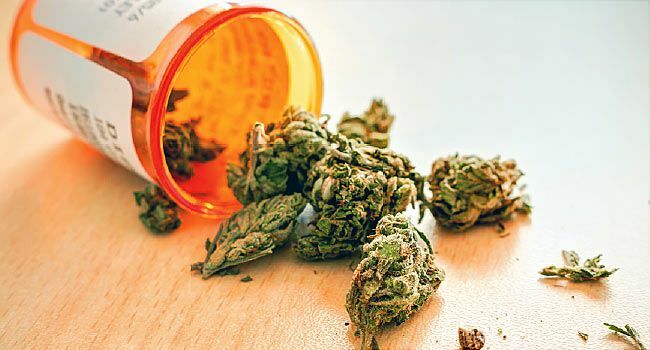 JAMA Internal Medicine: "The Role of Cannabis Legalization in the Opioid Crisis." European Journal of Internal Medicine: "Prospective analysis of safety and efficacy of medical cannabis in large unselected population of patients with cancer." Cochrane Database System Review: "Cannabis-based medicines for chronic neuropathic pain in adults." Clinical Neuropharmacology: "Medical Cannabis in Parkinson Disease: Real-Life Patients' Experience." Journal of Clinical Rheumatology: "Medical Cannabis for the Treatment of Fibromyalgia." Current Neurology and Neuroscience Reports: "The Use of Cannabis and Cannabinoids in Treating Symptoms of Multiple Sclerosis: a Systematic Review of Reviews." World Health Organization: "Cannabidiol (CBD) Pre-Review Report," Expert Committee on Drug Dependence Thirty-ninth Meeting, Geneva, Switzerland, Nov. 6-10, 2017.